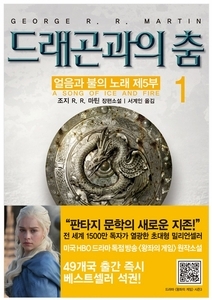 About this book : The 5th book in 'A Song of Ice and Fire', a series with uncountable fancy titles such as 'The Million Seller Read Passionately by 15,000,000', Sweeping Bestseller As Soon As Released in 49 Countries, The New Horizon in Fantasy Literature. The Seven Kingdom has been impoverished because of the big-scale war. The kingdom is threatened from all directions, and its destiny is put on the scale. From the east, Daenerys is House Targaryen's last descendant, and she becomes the queen of the city on top of ashes and death with three dragons. However, she is the target of thousands of enemies. Tyrion, who runs away from Westeros after getting a bounty on his head, also seeks Daenerys. On the other hand, the 998th Road Commander of the north Night Water, Jon Snow, faces the biggest danger in his life.